This is an armless chair that can fit in well with your already existing landscape and other items, or can combine with the other parts of the Pacific Outdoor Sectional Collection to make a stunning linear Outdoor Sectional. 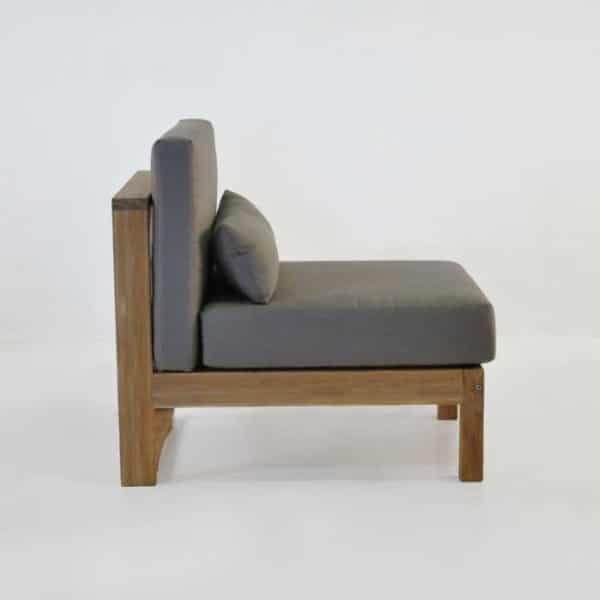 The very subdued, but still contemporary and hip Pacific center chair is an armless chair and a simple, elegant piece of outdoor teak furniture. W27" x D32" x H31"
While it’s simple, it doesn’t lack any of the sophistication that comes from the clean angled architecture of the Pacific collection. 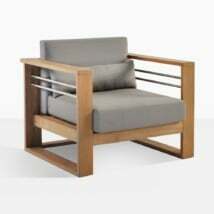 There isn’t exposed stainless steel on this piece, but the raw organic impact of this armless chair is till big. 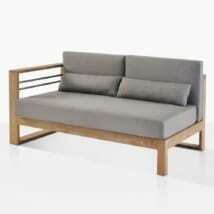 It has a strong and athletic presence with the combination of a very functional build and good-looking comfort. 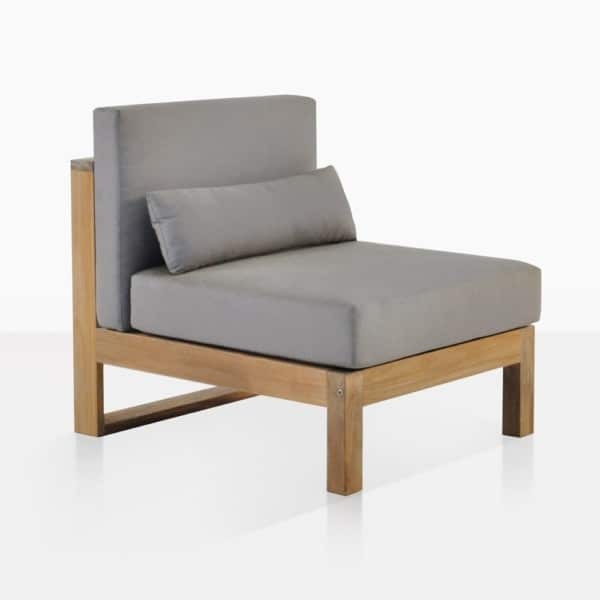 The square lines and contrasting Sunbrella® cushions give it a very edgy feel; the armless design and small footprint ensure it is able to mesh well with all of your existing pieces and your setting. 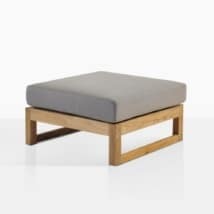 Lumbar support in the form of an included extra cushion offers a great way to use this piece. The upright posture makes it a perfect place to finish some work, or discuss some business in a more comfortable setting. The thick 6 inch Sunbrella® cushion makes it a chair you probably want to stay a bit longer on. All of the Sunbrella® cushions as shown are included. As part of an outdoor sectional, this armless chair is a valuable addition as a center to connect two other impeccable pieces of the Pacific Sectional Collection. 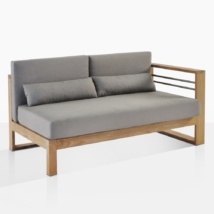 The clean lines and minimalist design allows you to pair it with additional pieces from the Pacific Outdoor Sectional Collection to assemble a linear, clean and comfortable teak sectional. 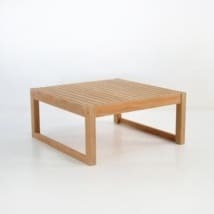 The open feel of the Pacific Teak Outdoor Furniture Collection is enhanced by this very versatile Sectional Center piece. While it is the most muted of the entire Pacific collection, don’t count this armless chair out as an impactful piece of teak outdoor furniture. The chiseled and defined look of this contemporary design gives it a multi-dimensional element. 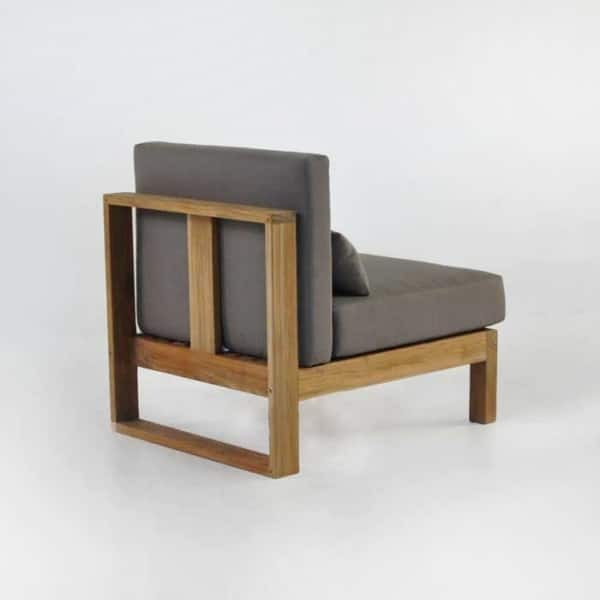 The warmth of the teak will allow you to place this armless chair just about anywhere and see it easily fit in. The cool edgy look will give it a purposeful determination to be the talked about piece in the room. The comfort and good, clean lines make it an indispensable part of your teak outdoor furniture.